Federer was spotted wearing this outfit during a practice session in Dubai. More pics to follow in the coming days. Stay Tuned. 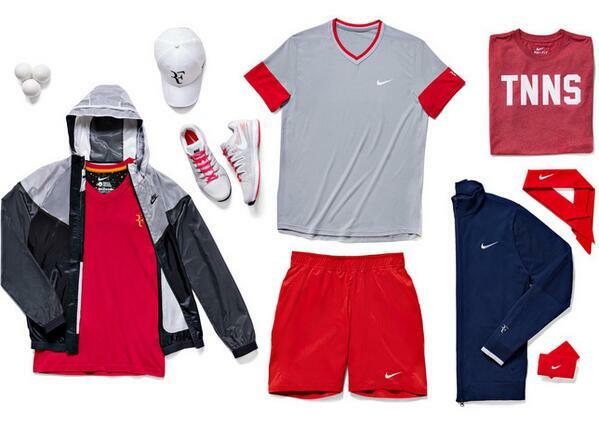 & in the mean time, for Roger Federer's outfit for Madrid & Rome Masters, 2014, click here. Haha, me neither, sausan, but I would be very interested to see how Roger will look in that outfit. It is very different from what he's been wearing so far. Pirate style, I think, which is more of Nadal's style. I like it. Makes a change I think. Only thing is I wish they'd abandon those patterned shorts that look like underpants! Will look better on Roger than on Nadal of course because he has a better body. Simple. No mate, that was actually published in the original catalogue, but now, Nike has confirmed the above outfit (posted in the 1st post above). The revised design is actually better than the original one, but still not that attractive, I think. Looks great as always. I think it suits him. Red shorts look much better. Looks quite good on Roger. I wonder what the color scheme of the shoes will be like. Will be interested to see if Nike have relented and given Roger the longer cut shorts this time. Photos of clothing on their own can be deceiving. Personally I preferred the longer and slightly less tightly fitting cut for his shorts ... They may even be more comfortable to wear too. Anyone know where I can buy the orange tennis shorts from ROger's play at the French Open? is anyone can tell me where can i found the red short from federer ( roland garros 2014 ) ?? Your best bet is to take a look at Nike webstore, search Roger Federer and click View All in the options. The T shirt is for sale there, there are some red shorts but they don't look quite so bright a red. There are some brighter red shorts in the general clothing section though.